Adventure Associates is thrilled that you will be joining this wondrous expedition to the High Artic, at the top of the world. 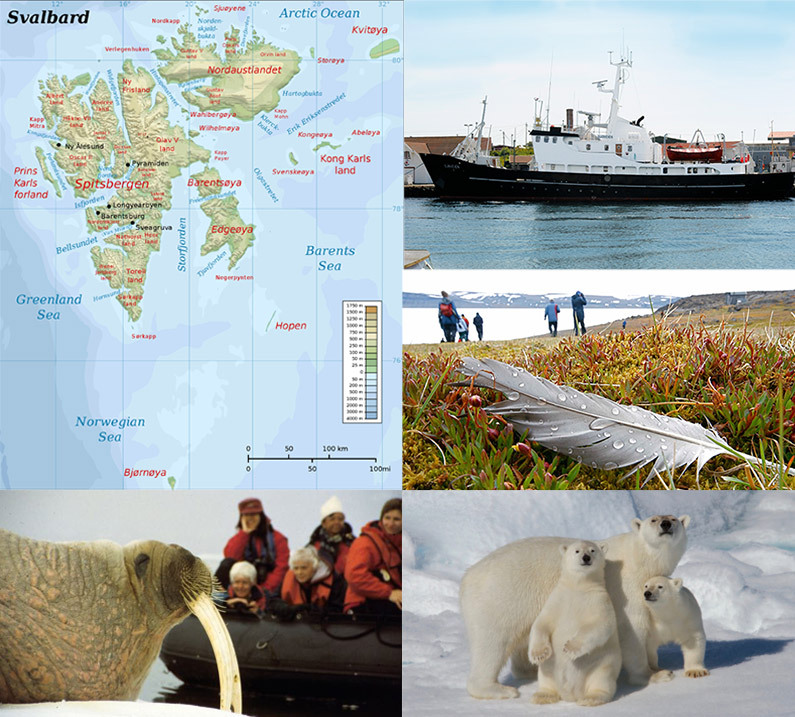 Svalbard is one of the world’s greatest polar bear denning areas. During a few precious months of the Arctic summer it is teeming with life. Millions of migrating birds arrive to feed and breed, walrus haul out on remote beaches to rest between foraging trips and the polar bears roam the coastline and sea ice in search of prey. And the last decade has seen a noticeable increase in the whale population. Armed with your “secret weapon”, the charming little ship M/S Sjøveien, and twenty four hours of daylight, you can go to places and see things that bigger ships will never do! Her compact size, shallow draft and with only twelve guests on board, gives you the advantage of great exibility. The perfect recipe for an adventure. Adventure Associates has been organising voyages to the polar regions since 1990 and have long dreamed of having a small vessel like M/S Sjøveien at its fingertips. This is a dream come true! Your voyage will focus on the spectacular fjords and the islands of Svalbard, which offer abundant bird life and the chance to encounter walrus, reindeer, ringed and bearded seals and with luck, the mighty polar bear. Ice conditions permitting, our aim is to reach the Hinlopen Strait and Nordaustlandet, the second largest island in the group – covered in parts by vast ice sheets. People who ordered Svalbard Explorer – Boutique Voyages to the High Arctic also ordered the free travel brochures below. Click on the images to find out more about these brochures.